What does Social Capital have to do with Digital Inclusion? View more presentations from clarewhite. Digital inclusion is the use of technology to improve the lives and life chances of disadvantaged people and the places in which they live. Social capital is a way of understanding the (positive and negative) impact of social networks and norms on people’s lives. What engagement approaches are being successfully used to overcome barriers (such as confidence, content, access) to digital inclusion, for example among young people not in work or education? How can we make sure we are not exacerbating existing inequalities by only serving the people already connected? What are successful examples of outreach? The paper points out the distinction in social capital between ‘bonding’ social capital – strong connections with people similar to us, such as friends and family; and ‘bridging’ social capital – weaker connections with people further removed from us, such as contacts, and acquaintances. Tim Davies will be reporting from the Seminar and Amy Sample Ward will be participating in the discussion and live blogging it now doubt. You can track the discussion happening online with this dashboard or join the conversation on the digital engagement network site or blog. 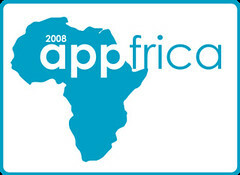 AppAfrica is series of international technology conferences and forums for software developers, entrepreneurs, ngo’s and others interested in discussing how web technologies can benefit developing nations. Whether this be strengthening economies by participating in the world marketplace or innovating operations as they currently exist. The first event will be held July 31 at Makerere University. Visit the live wiki for more. Really enjoyed this slideshow from Tara Hunt. Superheros seems to be a nonprofit fundraising meme these days. That's my Dad who is 86 and who calls me on Skype. In fact, a few weeks ago, I forgot to turn off my skype connection during a workshop and my laptop was being projected on a screen. It was about the time that several participants in the session who were close to retirement age started to complain that they were too old to participate in social media. I swear I didn't secretly twitter on my cell phone to my dad to call in! The last time I visited with my Dad at home, I showed him youtube, videoblogging, and how to set up a blog. He was interested and enjoyed his few minutes of fame on YouTube. 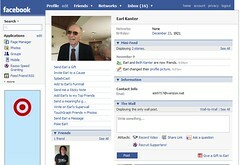 Last weekend, I visited, and showed him how to set up a Facebook profile. He was curious about Facebook and poked around, but declared it "cognitive overload." Now, my Dad has been a computer user since the early 1980s (as long as I have), so he is probably more geeky than your average octogenarian, but there are many elderly who are not. That's why programs like the Oasis program recently reported by NTEN are important to watch. The Give One, Get One campaign launched yesterday. 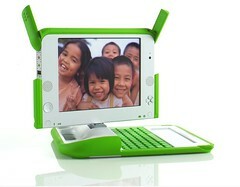 Between November 12 and November 26, OLPC is offering a Give One Get One program in the United States and Canada. During this time, you can donate the revolutionary XO laptop to a child in a developing nation, and also receive one for the child in your life in recognition of your contribution. I wrote about some of the challenges about using these laptops in Cambodia (primarily - can't load KhmerOS on them because the screen is too small) and you can' t designate the recipient or the country even. Nonetheless, I decided to make a donation to the project. The OLPC that arrives in this house will most likely stay here in the US for my children for a few months before making its way to the English class at the Sharing Foundation's computer school in Cambodia. Is Social Media Just for Young Folks? Do you think that people on social networking and media are just teens and college students? There is the well-known YouTube user, Geriatic 1927 who creates videos as a memoir of his WW2 days and has over 45,000 subscribers and 2 million views. And there are a number of bloggers in their 80's, but perhaps the best and most well-known is Millie Garfield. And, if they aren't blogging, they're reading, take for example the AARP Pet Pals Blog and the others identified in the comments here. Saga, a social networking site for over 50 crowd launched last month according to this Guardian Article. The site, which has been running in trial mode for four months, has more than 13,000 users so far - and the company hopes this will increase dramatically now it is officially open. "Older people aren't shy of using the internet - they have a verve for life that applies online as well as offline," said Paul Green, a Saga spokesman. "Thirteen thousand is just a drop in the ocean - in theory the membership is practically limitless. Social networking isn't going to be for everyone, but the feedback so far has knocked our socks off." One wonders if this site will catch on or go the way of Eons which is struggling. Yes, the social networking site demographics are aging, but maybe as fast as pace as other segments. Rising s, the outreach arm of Global s, is now accepting project proposals for the first round of microgrant funding of up to $5,000 for new media outreach projects. Ideal applicants will present innovative and detailed proposals to teach citizen media techniques to communities that are poorly positioned to discover and take advantage of tools like blogging, video-blogging, and podcasting on their own. The complete information is here. Grant deadline is June 15th. My colleague Mary Joyce who writes a blog called "ZapBoom: The Sound That Change Makes" that focuses on the question, "Under what conditions does citizen activism occur and how can it be supported and encouraged?" She has is supporting a campaign to Free Monem, a blogger arrested by Egyptians security forces on April 15th. He was charged with several crimes, including "belonging to an illegal organization" and "organizing secret meetings with the aim of disturbing public order." According to Mary, his real crime was challenging the dictatorial regime of Hosni Mubarak by telling the truth about the torture he underwent and condemning the country's unjust military tribunals. 1. Watch the protest video. Share it with your friends. 2. Add the Free Monem quote randomizer badge to your blog's sidebar. "We [Egyptians] claimed freedom for others and forget our own freedom"
"If I taught a woman to wear a veil, I should teach her to claim her right to enter the university wearing the veil." "Freedom is now an obligation and should be implemented before Sharia'a"
Eventually, quotes from other imprisoned bloggers will also be added to the quote feed. Just sit back and let the free speech flow. 3. Re-publish Monem's posts on your own blog. For the last few days a crack team of volunteers from around the world has been translating Monem's posts so millions of new readers can read his censored speech. Let's show Mubarak that his attempt to silence this blogger has been completely counterproductive. Instead of reducing the number of people who read Monem's words, let's make sure that the number of readers increases... exponentially! It's easy to take part! Just pick a post by Monem from the list below and copy and paste the whole thing (or an excerpt) into your own blog. It would also be great if you could tag your post (using Technorati or deli.cio.us) with the words "FreeMonem" to help us keep track of how many people take part in this action. NpTech in China? Can you help? A few weeks ago I received an email from Jerry Hu introducing me to the Fuping Development Institute in Beijing, China. The organization works on poverty alleviation and sustainable development through activities in five main fields of work: establishment of civil society, corporate social responsibility and social investments, environment and sustainable development, education and employment, and integrated community development. The development level of NPOs in China is far behind with foreign countries, but we can keep up in IT area and Internet usage, Web2.0, blog, podcast are also popular words here. So what I concerned is how technology can help NPOs and individual to make a difference in China. I wanted to study the current situation in foreign countries and how can we start to follow. 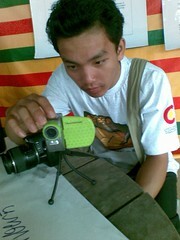 I am looking for reports or articles about how technology help NPO to make social change. our non-profit world. We need to focus on some fundamental use of technology in NPOs. Can you help? What studies, reports, or articles would you recommend that Jerry read? A few months back, colleague Jayne Cravens was off to Afghanistan, to serve as Communication and Reporting Advisor for the United Nation's National Area-Based Development Programme (NABDP), part of UNDP. I wrote a bon voyage post here. 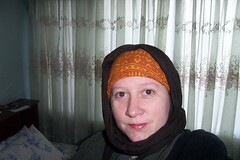 Jayne recently dropped me an email pointing to her photos from Kabul. You can keep current with Jayne's adventures on her blog. They were amazed that it is so easy to do, easier than maintaining a website for instance. We did two videos in the office together for fun, then did two video interviews jointly. The last two videos were published on their own. You can see them all on the GINKS blog. The 12-Step vlogging process is an excellent primer for beginner "Social Reporters," or for anyone who wants to do video blog interviews at conferences. There is an IBM podcast too on how to get started with online video. In it, they also make the point that it is very easy to get started with video editing software which is already may be on your computer (like windows moviemaker) which is of reasonably good quality. In combination with the easiness of uploading it to various site, and the possibility of tagging and blogging these video productions, it is a powerful way of bringing people closer together. Thank you Joitske for an excellent video blogging training curriculum that can not only be useful to ngos in developing countries, but generally for nonprofits who want to start video blogging. I've been following Unicef's Field Notes Blog. The posts are from people working in different countries on child survival work. The blog tagline says it all, "Blogging gives us the ability to quickly report from the field, alert you to media coverage of interest, and share the success of UNICEF's lifesaving work around the globe." 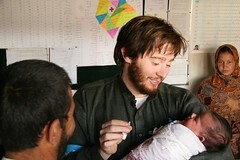 The most recent set of posts are from Clay Aiken's field work in Afghanistan and also includes flickr photos. Along with the reports, there is a fundraising campaign. What is most interesting about this blog is the active conversation taking place in the comments section. CTCNet's new Connections for All (C4All) program offers a variety of opportunities for you to enhance your CTC's capacity to serve people with a broad range of abilities. AllianceThe centerpiece of the C4All program is the Accessibility Grant. Following a competitive grant application process in early spring 2007, CTCNet will award 14 organizations with $20,000 Accessibility Grants. Funding can be used to address issues in the areas of assistive technology, staff training and development, community outreach, program enhancement, and facilities improvements. Also included is 30 hours of technical assistance from thefor Technology Access (ATA). The AccessNow Award is another way that C4All can help your CTC expand access. These $1000 awards allow CTCs to quickly implement simple and cost-effective measures to make programs more inviting and accessible to people with a broad range of abilities. To be eligible for these funding opportunities, you must attend a C4All Accessibility Institute. Offered in 10 cities in 7 different states, these trainings are a valuable way to learn how to assess, plan for, and implement strategies to make your CTC more accessible, and they are an important step in preparing for the grant application process. Visit www.ctcnet.org for more information about funding eligibility, as well as Institute locations and schedule. I "met" Ali while lurking on the UK Riders list, a peer group of ICT circuit riders. She caught my attention because she founded an organization that works with orphaned and disabled children in Kenya. She also asked some really good questions about blogging for ngos on the listserv. She shares why she started her NGO, "The economic situation is far worse in Kenya than China so volunteer teachers were the only option. I decided to make AVIF a charity rather than a company as people are always more willing to offer time to a non-profit organisation. That said we are hoping to launch a trading company allowing all the orphanages and communities we reach in Kenya to sell their hand-made local crafts; bags, sandals, pumice, soapstone, plates, jewellery etc, to further their own futures. Trade not Aid !" AVIF is a virtual organization that uses free and low-cost Internet technologies like VOIP to manage its programs and development work from the UK. Notes Ali, "It is me in my living room and a friend named Sharn Argwings-Kodhek networking in Nairobi. 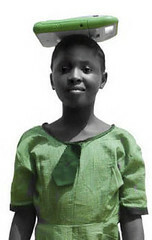 We access all orphanages via the internet. We have a substantial network of people we speak to by SKPE or SMS. Kenya has a poor bandwidth at best and this limits internet access to email only in most areas, except large corporations in large towns. Mobile communications are extremely accessible however, with very few dead zones." The organization works directly with local ngos and volunteers matching them by interest, need, and skills. Organizations in Kenya are carefully vetted. Notes Ali, "Unfortunately there is a lot of corruption and greed in Kenya. Assigning volunteers to work with vetted organisations allows us to fully verify the organization's commitment to the children. " AVIF plans to open an online shop to sell items to raise money for its program. "We have a large number of really beautifully-made items, hand made by the communities the volunteers lived with this summer. They have sent me photographs, weights and full descriptions of all the items. These items will be listed and hopefully sold on our online shop and the items packaged by the Kenyans and dropped with DHL for global delivery." AVIF uses the Internet to recruit volunteers. Notes Ali, "We advertise for free on the very many ESL /TEFL websites for teachers and also recruit many primary education student-teachers in 2/3rd year of university degrees via the UK government's Teaching Development Agency (TDA). We also advertise the Volunteer Centres in the UK web sites." The organization has just started to use a blog to engage volunteers and others interested in their work in a conversation. Volunteers are able to post about their experience in country. Notes Ali, "Blogs also allow much more "real" info as well as progress reports. It is so much more alive than a static web site. 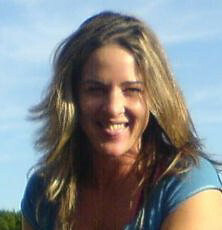 We've just begun blogging and thankfully I've been helped by my peers on the UK riders group." That's my avatar, I'm live blogging from Second Life. That's Danah Boyd in RL who was also live blogging the event. 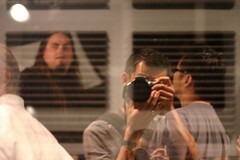 Photo from public photos tagged with macarthur in NMC flickr stream. This morning I attended the MacArthur Foundation Digital Learning briefing that was taking place at the Natural History Museum in NYC. It was the ultimate digital media multi-tasking experience. 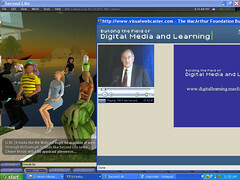 From my office in the Boston, I teleported myself into the Virtual World of Second Life and headed straight for the New Media Consortium virtual campus where I joined about 65 other avatars representing educators from all over the world (even Austrailia where it was 3:00 a.m. local time). I also had a web browser window open so I could watch the videocast of event. 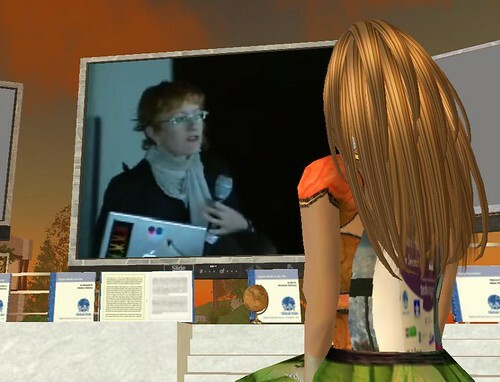 While the speakers were talking, the avatars in Second Life were carrying on a lively debate in chat about the points raised, suggesting questions to be asked in the room in New York City, and passing along urls/resources related to the discussion at hand. Several avatars were also in "real life" in New York City. In fact, my colleague Rik Riel IM me and asked for a teleport into the location. 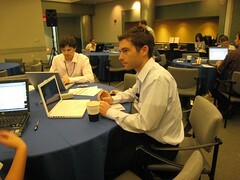 He was also in NYC and live blogging the event as was Danah Boyd - the official MacArthur Foundation live blogger. At the end, when asked what it was like to be live blogging the event, Danah observed that she took a lot of notes that no one would want to read unless they put into context. "As a blogger, one issue is 'who is reading?' and I have to put this into context for people who were not at this event and may have only heard of the MacArthur Foundation on NPR." The MacArthur Foundation announced that it will be funding a five-year $50 million initiative, mostly for research, to try to understand how young people are using digital media and its impact learning. As the president of the MacArthur Foundation noted, "It is the beginning of a new cross interdisciplinary field and we all feel it." At that comment, all the avatars started clapping, cheering, and agreeing with quips like "Wow, MacArthur Foundation really gets it. They are walking the walk, talking the talk." Some statistics about how many young people are using various social media tools. But it was pointed out that there is a lot known about the numbers and less is known about how they are using, the role it plays, and what it means to them. The environment for learning is no longer in the classroom and its online, and outside of school. MacArthur wants to know: How is digital media changing the way that children learn and develop and what are the implications? Digital media is being shaped by the private sector (YouTube, MySpace, etc). These social networking spaces are becoming the place where a lot of (informal) learning by young people is taking place. Educators need to intervene and make creative alliances. There is a huge gap in understanding between what young people are doing with social media spaces and what adults perceive. (The opening presentation showed kids talking about how they social media and adults misconceptions ..) It isn't entertainment. These are complex learning environments where young people are making decisions, learning and collaborating with peers, etc. Learning is happening outside of school and it needs to be understood better. Henry Jenkins notes that it isn't about the tools and that it was more about the culture growing up around the technology. "We are in a moment of time where 57% of teens produce and share media. Media isn't just happening to kids. We should be more concerned with what our kids are doing with media. Also, not all kids are digital natives." He described a new digital divide that wasn't about having access to computers. Young people have access to computers in schools and libraries, but there is a difference in the quality of experience. There is a gap in social skills, experience, and knowledge when you only have 10-15 minutes of access in library versus 24/7 access at home. The young people who don't have pervasive access will fall behind in terms of skills. He warned that parents and educators do not need to be looking over the shoulders of young people and that we shouldn't be leading by fear and anxiety, but my knowledge and information. He noted that media literacy has to be integrated as a skill set in all places. It starts in the home. Parents are facing challenges. Parents have an opportunity to spend time with kids and learn about the media they're consuming. The only advice out there is to limit screen time. He suggests developing a dialogue with your child about media. Media literacy and creation skills can't be add-ons in schools, but have to be integrated across the curriculum in all subjects. Dr. Mizuko Ito made the point that digital learning is happening primarily outside fo the classroom and in more of a social and play context. "We know very little about the learning that is happening outside of classrooms." She mentioned that learning is being initiated by young people on their own terms and by having a better understanding of these online environments, it will give some hints about how to harness the technology for formal learning in the classroom. Jenkins from MIT described something called "convergence culture." He used the example of Harry Potter books - not just reading them, but young people working on collaborative writing projects via the Web -- writing and getting feedback from peers around the world. He also described the educational projects in Second Life where young people are constructing their own worlds and are teaching other programming skills as well as social, economic, and cultural interaction. "What are the things that kids need to know to be rich participants in these spaces?" Dr. Mizuko described some findings in their research about informal learning and using games, even simple games like card trading games. "It is important to recongize that these are complex learning environments and information systems. The design of media is for more activist and personal interaction. 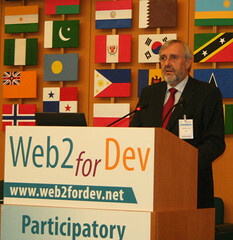 We need to understand the properties of how knowledge is exchanged and developed in these peer-based online networks. There is no question that these are robust learning environments." "Learning is happening outside of school and in informal ways." "Kids are learning from each other." "All our kids have laptops, when we go to museum - kids take their laptops and cameras with them. They focus on the media creation of what they learned. They document their learning." Later in the conversation, it was noted that change will come, but slowly. It was opened up for question and answer both in New York and in Second Life. I'm picking out two questions that were interesting to me. Someone from PBS asked a question about how TV might be part of the future of the world that was being envisioned? Jenkins answered, "What does the next generation of Blues Clues look like? How does social networking/web2.0 get embedded in PBS programming? It has to be governed by Web2.0 - kids will be making media. It can't just teach them to think about media, but making it on your own terms." Media literacy is a paradigm shift - not an add-in subject. The other question was about mult-tasking and how it impacted learning experience. Dr. Mizuko mentioned some research they were doing on continuous partial attention of young people's media and mobile phone use. "Kids are inhabiting multiple worlds with 26 IRC and IM windows open. She alluded to the upside and downside to continuous partial attention. This inspired quite a lot of comments in the backchannel chat on Second Life. I don't think that "inhabiting multiple worlds" is the same as multitasking. It crosses devices and time and not just one screen is the reality Rapid attention shifting is not the same as continuous partial attention, in my view. We are having a conversation here, listening to this presentation, and I for one am exploring linkspeople have posted all relatively simultaneously, is that multitasking? This chat is gettign pretty good! Love the backchannel!! I think that rapid attention shifting is one way of thinking about "critical thinking"
This is a very interesting discussion about multitasking. What are the NY folks talking about. -One of the points mentions that this is a new field - digital learning and media and that it was a cross disciplinary field. Given all this potential change in education, what do we need to think about how all this applies to nonprofit sector? How does media creation and social networking skills change the way we work in nonprofits? The young woman in the pink shirt and gloves is Maria Estela Godinez. She recently shared the stage with Intel Chairman, Craig R. Barrett, during his keynote at the Digital Leaders Forum as part of his Latin America trip. Maria Estela built a glove that allows speech-challenged people to move their fingers in a similar fashion to Braille language and have those signals recognized by software that converts them into speech. She did it all by herself (hardware and software) with the help of teachers and mentors. She did such a great job that she went on to win three awards this spring at ISEF, the Intel International Science and Engineering Fair that Intel sponsors every year. Maria Estela won two awards for Computer Science (one in the individual category and another one in the overall category beating the winner in the group category) and won the IEEE award as well. Maria Estela recalls how when they announced the winner in the first category, the announcer couldn’t quite pronounce the name of her town well. The person presenting the award said “San Francisco…” and hesitated to say “del Rincón”. In the mean time the San Francisco, California team began to scream and celebrate… only to hear her name as the winner. She went on stage when Craig invited her up. The only truly familiar face in the crowd was her mother. She went on stage confidently and started to tell her story. She told Craig about her project and demonstrated how the electronic glove works. As she made every move everybody was fascinated with her story. Colombia’s Minister of Communications began to cry in her front row seat; deeply touched, as most of us were. We were all listening to every word she said. When she was done, we all cheered her with a warm ovation. BTW, Ricardo Carreon is a blogger living in South America and works for Intel. He is interested in NGO activities, including youth leadership and education. I follow his delicious tag stream and enjoy his flickr photos, particularly those depicting South American landscape and culture. What happens when you give a grantmaker a camera and flickr account? An interesting use of flickr as a documentation tool! Check out this photo set of the launch of a mesh network in rural San Diego for Indian Communities, San Diego Tribal Digital Village. Last May, I documented a project of the Sharing Foundation's in flickr. (It's the college sponsorship program). 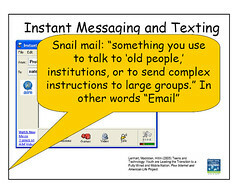 I got a comment with a great idea - take the flickr API and integrate some Andy Goodman story telling structure and viola an online story generator! If you want to talk about flickr and nonprofits, there's a place to do so here.